Successfully Added DVS (CCTV & DVR) with 128MB SD Card to your Shopping Cart. Can store about 2000 pieces of picture/400 video clips. 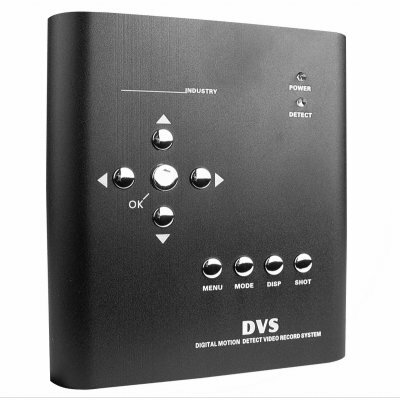 The basic function of the Digital Motion Detect Video Recorder can be summarized: DVS=CCTV+DVR, that is to say, the camera can shoot and record automatically/manually once moving object appears and keeps the pictures in the internal memory or SD card when needs to take a quick shot; besides, the user can examine the pictures on TV (monitor) or computer (need to install reader) at any moment and also can keep the pictures in the computer. Up to now, almost all the alarm systems/video interphone systems do not have the function of picture-taking and record-shooting, and thus it undoubtedly brings on much inconvenience to people in their safeguard-keeping. However, here comes our DVS - the cheapest multifunctional DVR. It can compensate for all what the alarm system/video interphone lacks and as long as it is installed, the unction of motion-detecting "picture-taking" and record-shooting" will be added automatically. Moreover, this smart product can work independently even without the need to install any other appointed software program to make it run, thus it is extremely versatile and powerful in function aspect. Besides, comparing with the traditional security protecting products available nowadays, our DVS is much more eye-catching and competitive in the sales market! As a result, it is no doubt that there will be a capacious room for its distribution and promotion! Hesitating still? Or you may lose the best opportunity for fortune-seeking!